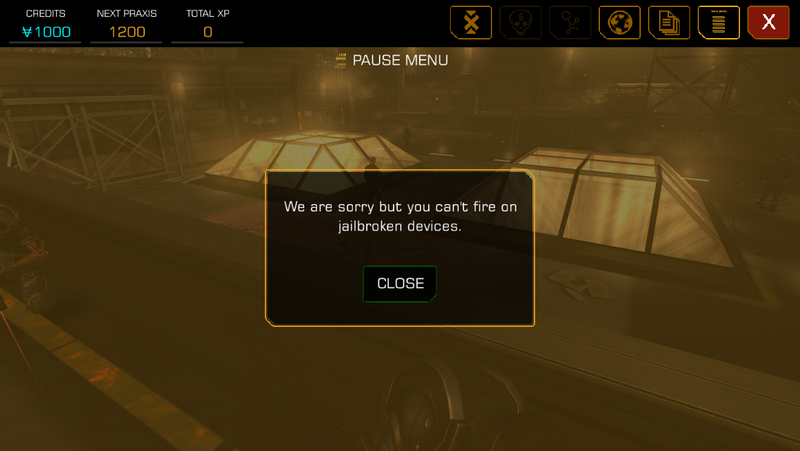 It appears that Square-Enix is punishing jailbroken iOS users who purchased Deus Ex: The Fall by disabling their ability to fire guns. Other Reddit users have confirmed the message’s authenticity, as they are unable to finish the gameplay shooting tutorial, or use tranquilizer guns to play non-lethally in the game. This game-breaking move by Square-Enix was presumably done to fight piracy on the first mobile entry for the Deus Ex series. However, not all jailbroken iOS users download pirated software, but instead use it to download programs unapproved by Apple’s strict ruling. Jailbreaking an iOS system is also legal in the United States under the Digital Millennium Copyright Act, although Apple warns doing so will void your warranty. Deus Ex: The Fall has come under scrutiny by fans of the cyberpunk action-stealth series ever since the latest installment was revealed to be a mobile game. While Deus Ex: The Fall has mostly scored above average reviews on Metacritic and GameRankings, this troublesome occurrence by Square-Enix will once again shed negative light on the $6.99 game.